Today is D-Day for all three.
. The Roy Green review presented the report of its inquiry into Australia's textile, clothing and footwear industry to the Industry Minister Kim Carr today. The government will pubish each and respond to each within weeks! The symbolism is appalling. Just when the world most needed a breakthrough on climate change, its seven-year battle to get one on trade at the Doha talks broke down. And then just hours later Australia signed its own one-on-one Free Trade Agreement with Chile. What's wrong with separate one-on-one side deals of the kind that became ubiquitous under the previous government? We're going to see a lot more of them. Without a worldwide trade agreement the only way to break down trade barriers will be through a patchwork of one-on-one and regional agreements. What's wrong with such “free trade agreements” is that they often anti-trade. Researchers at the Productivity Commission have found that separate side deals more often hurt trade than help it. A few years back the Commission examined the effects of 18 of the world's major Free Trade Agreements - or “preferential trade agreements” as it more accurately called them – and found that 12 had actually been anti-trade. It's because while free-trade agreements such as the one between Australia and the US confine allow each special access to each others' market and so increase that trade, they cut back other trade. One way this happens is through “rules of origin”. Under the agreement the US will only allow Australian goods into its country on preferential terms if they are “substantially” Australian. That means that Australian goods that could once freely include imported content are made to restrict it in order to get preferential access to the US. Complicated? You bet. The US-Australia Free Trade Agreement includes a “yarn-forward” rule that requires the yarn that is used to make fabric that is preferentially traded between Australia and the US to be “formed” within one of the two. Australia is no longer free to source its yarn from the cheapest supplier – unless it wants to miss out on “free” access to the US. And when the growing patchwork of individual free-trade agreements begin to overlap the complications multiply. That's why Kevin Rudd has described what we are left with as an absolute tragedy. Australia's Trade Minister Simon Crean who has been working 18-hour days in Geneva in an attempt to ensure there is a global trade agreement described what a world would be like without one a few months ago. “It would be a world built around preferential trade blocs, further favouring large powerful nations at the expense of smaller ones. Small countries would be locked out of deals with major trading partners and left to languish,” he said. It's what's in store, and once it takes hold it will be very hard to undo. Richard Adams, Philippa Dee, Jyothi Gali and Greg McGuire, The Trade and Investment Effects of Preferential Trading Arrangements - Old and New Evidence, Productivity Commission Staff Working Paper, July 2003. The Neuromarketing blog picks up where I left off, putting it all together. It makes sense to serve cheap wine in expensive bottles. Neuromarketing explains why, using graphs! "He or she would be serving the wine that he knew they would find most appealing in a blind test, and further enhancing their satisfaction by convincing them that the wine was a costly vintage. Best of all, he or she would have the research to prove it." Australian business confidence has fallen to recession levels and bank shares have fallen further as the International Monetary Fund has warned that of elevated global financial risks. The report came as the giant US investment bank Merrill Lynch announced plans to unload its mortgage-backed securities at fire sale prices, selling securities it bought for $US30 billion for under $US7 billion. On Friday the National Australia Bank wrote down the value of its $1.2 billion of mortgage-backed securities by 90 per cent. On Monday the ANZ increased its provision for bad loans by $375 million. Both share prices plunged further yesterday, the NAB falling a further 4 per cent and the ANZ a further 1.8 per cent. The Commonwealth Bank fell 4.3 per cent. The National Australia Bank has lost 8 per cent of its value in the last week; the ANZ 12 per cent. The latest NAB quarterly survey finds businesses throughout the country gloomy with confidence down to levels not seen since the 1991 recession. The bank said the medium term viability of firms was under question as slowing demand and rising interest rate and oil costs ate into profitability. The profitability index fell a further 6 points over the June quarter to just above the zero line. “The Reserve Bank will take this as a sign that the rate hikes are working,” said Commonwealth Securities economist Savanth Sebastian. The All Ordinaries share market index lost 15 per cent of its value in the year to June and has lost a further 6 per cent since then. The typical Australian balanced superannuation fund lost 6.4 per cent of its value during the financial year and has probably lost another 3.5 per cent since then. The head of investment markets research at Colonial First State Hans Kunnen said investors were asking whether the slump was likely to be protracted like the early-mid 1970s or shorter and sharper like the early 1990. “Many of them long-term investors and superannuation-type folk who are prepared to hang in there, but for a lot of the smaller investors I think fear has overcome them and if you look at the market it seems to be pricing in recession,” he told ABC radio. “The IMF’s assessment is that risks to the stability of the global financial system remain elevated, particularly given increasing concerns over the global economic outlook,” he said. The NAB survey found that business conditions deteriorated in most sectors except for mining. Businesses had wound back their hiring plans for the next 12 months. "Compensation, we want carbon reduction compensation!" The latest news is that Brendan Nelson is apparently going to withdraw the Coalition's support for an emissions trading scheme until it is clear that the rest of the world will come on board. Tim Colebatch today makes the point that Europe is already on board, the US will start moving that way as soon as Obama or McCain moves into the Oval Office, and that Japan is likely to do the same. "That leaves China and India — whose emissions per head are a fraction of ours. Nelson has yet to spell out what he will demand that they do." Meanwhile Australia's poor oppressed energy companies want "compensation!" The bare bones of the Federal Government’s emissions trading scheme have been released — and it took about 10 minutes for poor, oppressed and innocent companies to put out the begging bowls. Woodside’s Don Voelte was warning within two days that he and every other LNG producer in the country would pull up stumps and head somewhere else. Chevron, working on its $20 billion WA Gorgon project, suggested it might just follow Woodside out the door if its special needs weren’t recognised. Power companies, particularly those public-owned enterprises trying to be sold by the NSW Government, cement manufacturers, oil refiners and others were also quick off the mark to warn of either their imminent demise or a mass exodus to the carbon-polluting badlands of China and India. Premier Alan Carpenter went public within hours of the release of the ETS arguing that the threshold for free pollution permits should be reduced from 1500 tonnes per $1 million of revenue to 1200 tonnes. Not surprisingly, industry insiders suggest Woodside and Chevron fall short of the 1500 tonnes threshold but get over the line at 1200 tonnes. But — and this is a big but — is that true? There has been some research into this very question overseas, mostly focused on Europe where a carbon emissions scheme has been running for some time and the price of carbon is around €35 ($60) a tonne, much higher than the expected $10-$20 a tonne in the Australian scheme. And they’ve found that there’s been almost no movement from ETS-affected nations to non-ETS nations. Even the aluminium industry, which under the Federal Government’s scheme would get 90 per cent of its required permits free, has stayed put in Europe rather than rush off to Russia, China or India. Why? Because the benefits of being close to customers, previous investment, good environmental standards, reliability of inputs supply (electricity or businesses aren’t shut down periodically or collapse as happens in certain other nations) outweigh the extra costs of an ETS. A recent report out of the US called Levelling the Carbon Playing Field estimated that the companies potentially affected by an emissions trading scheme in America amounted to 3 per cent of GDP and 2 per cent of total employment. Australia’s economic make-up is slightly different from that of the US, but not by that much. The very fact no one has disputed the Government’s claims that the total number of companies that will need permits under its proposed ETS is just 1000 suggests that full impact — and potential threat to the economic future of Australia — is so far greatly over-stated. Is Mr Voelte really going to surrender the $15 billion sunk into the North-West Shelf and the potential billions in the Pluto LNG project which already has 15-year sales agreements with Kansai Electric and Tokyo Gas over the free permit issue? Makes you wonder what a couple of bit-player companies like ExxonMobil and BHP Billiton are doing spending $1.3 billion on an oil and gas project in Bass Strait. Production is due to start in 2011 — after the ETS is operational. Mr Voelte is simply doing what his shareholders would expect of him — trying to get the best possible deal out of the Government to maximise the potential profits accruing to Woodside. At the truly macro-economic level, the profit share going to companies is at an all-time high and the share of profits returning to workers is at a near all-time low. And those enjoying the best gains in profits also happen to be those who are pumping the most greenhouse gases into the environment. While there might be some sympathy for trade-exposed companies which fall short of the free permit threshold, have a look at the bigger picture. For every free permit, the cost borne by every other industry, by every other individual taxpayer, increases. While LNG is important, it pales in comparison to the $292 billion retail sector that employs around 1.2 million Australians. There’s Buckley’s chance of retailing getting protection even though it is worth far more to the national economy than LNG. The ETS is not the only policy issue where the Chicken Littles of certain industries have been squawking. The Federal Government’s move to end the excise-free arrangement on condensate out of the North-West Shelf has provoked some simply amazing claims by the affected companies. This was best illustrated by evidence from the Shelf’s joint venture companies to a recent Senate committee in which it was suggested the Government’s Budget decision had undermined Australia’s sovereign risk standing. By changing a tax arrangement close to 30 years old, the joint venture complained Australia was as risky as Papua New Guinea when it came to big-scale investment. By the way, Australia remains ranked among the most secure nations in which to invest by authorities such as the OECD, while PNG remains just above Iraq and Afghanistan. Again, you have to wonder where the joint venture would rank the Rudd Government compared with Hugo Chavez and his nationalisation campaign of Venezuela’s oil, cement and steel industries. There’s been no complaint from the joint ventures for tax changes over the past 30 years that have reduced their payable tax. So, the real argument is that you can make a change to a tax arrangement, as long as they’re better off for it. Again, there’s nothing wrong with companies trying to protect their bottom lines and the share price. You’d be worried if they didn’t. Ultimately, it looks like the condensate tax change will stand. But the LNG companies stand a good chance to get a change in the threshold rates for free permits that will satisfy their demands or some sort of handout to offset some of the costs they will face. For taxpayers, it’s probably a one-all draw and the same for the environment. What it highlights is just how many pitfalls there are in change, especially when so many vested interests are at stake. There isn’t a parent, there isn’t a teacher, who wouldn’t like lower school class sizes. The ACT Opposition is counting on it. At a cost that will eventually climb to $14 million per year they are promising to cut the size of every government primary school class to 21. All that’s missing is the money and the evidence. Put another way, what’s missing is evidence that cutting the class sizes would be value for money. It only makes sense if you compare it to the value that could be got if the $14 million per year was spent in another way. It could be spent on salary bonuses for teachers who are really good. An extra $10,000 or an extra $20,000 per year might keep and attract the teachers that we really need as well as fostering a culture of excellence. The Liberals say they’ve got evidence that lower class sizes would improve educational outcomes. But it is so weak as to be embarrassing. Quoted with approval in their policy document, it a study undertaken for the NSW government that asked parents, principals and teachers “whether they thought the class size reduction had had an impact upon student attainment in literacy and numeracy”. Lower class sizes often seem to help. We see them in special classes for poorly-performing students and for gifted children. But that doesn’t mean they help generally. Project Star in the United States was the biggest attempt to answer the question. It cut class sizes in a randomly selected group of Tennessee schools and then compared the results of their students to the results of those in schools whose class-sizes hadn’t been cut. The results were impressive, but tainted. The teachers knew about the trial and knew that if it succeeded class sizes would be cut statewide. Andrew Leigh of the ANU points to a better more recent study by Harvard University's Professor Caroline Hoxby who compared the results of students in classes that just happened to be large with those that just happened to be small. As he puts it, her massive study found the effect of class size on performance to be “precisely nil”. So we won’t miss out on much if the Liberals don’t win. 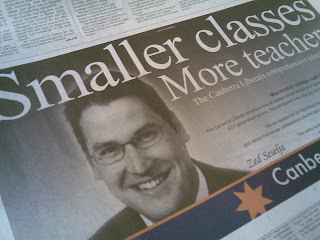 Canberra Liberals, First Class Education Policy, July 2008. Got something to say about Tasmanian water? Should it flow to Melbourne, freeing Victoria's water to flow to Adelaide? Commentator Dave Bath says the inquiry into Melbourne's Future water supply, set up by the Vic Victorian Legislative Council is now open for submissions. Some details on the inquiry here. Kenneth Davidson in the Melbourne Age continues to promote the idea. Are we in a boom, or a recession, or what? You could be forgiven for not recognising your own country. On one hand we are continually being told that we are on the edge of recession. 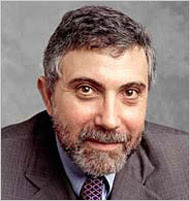 Two of the recent headlines have warned us of a “recession mentality” and “fears of recession”. And they’re just the ones in The Canberra Times. The National Australia Bank says interest rates will have to be cut five times in the next year in order to avoid a recession; TD Securities says up to seven times. On the other hand we are we are being told we are being showered with money. Rio Tinto has just scored a near doubling of its iron-ore prices. Our income from coking coal is expected to jump 123 per cent; our income from natural gas 67 per cent. So much of foreign money is sloshing around that it is pushing up our prices on a scale not seen since the start of the 1990s. On Wednesday we heard that inflation had touched 4.5 per cent – way beyond the Reserve Bank’s 2 to 3 per cent target band. Both the ANZ and Access Economics say interest rates may have to rise next year in order to rein it in. So who’s right? Which country are we in?.. The first thing to say is that the talk of a recession is overblown. The ACT illustrates this well. On the figures we are closer than any other state or territory to recession. Our State Final Demand actually fell in the three months to March and may have fallen again in the months to June. Everyone else’s is climbing. Our spending in our shops has stalled. Neither our house prices nor our rents are rising. And yet it doesn’t feel like a recession to those of us who live here. We may be being more careful about our spending than we were before mortgage rates and petrol prices bit, but we aren’t on the street. In fact Canberra is the only city in which there are more job vacancies than people able to fill them. And there’s another reason why a recession is most unlikely. Australia has better tools to avoid one than just about any other developed nation. The Reserve Bank’s so-called “cash rate” which it can cut to boost the economy is about the highest there is. At 7.25 per cent our Reserve Bank has room to cut the rate again and in order to avoid a recession. The US, with a Fed Funds Rate of 2.00 per cent, can’t do it as much. Japan, whose rate is 0.5 per cent, can do even less. It’s the same with government spending. Our budget surpluses parked in vehicles such as the Building Australia Fund are frighteningly large. Should a recession look likely our government is in a position to deliver tax cuts and spending programs big enough to stop it before it starts. Of course, no nation is recession-proof. We have avoided one since the start of the 1990’s – our longest run ever. Eventually our luck and skill will run out. But our decision-makers are more skilled than they were. Among the Reserve Bank officials who misread things at the end of the 1980’s and helped push Australia into recession was the present Reserve Bank Governor, Glenn Stevens. The Macquarie Bank’s Rory Robertson, a colleague of Glenn Stevens’ back then, tells how in the second half of 1989 a gaggle of them would huddle around the sole news-screen each time the employment figures came out and marvel at the on-going strength of the economy only to learn later that it had been heading south and that employment hadn’t caught up. They won’t make that mistake again. The Reserve Bank has made it clear that it is prepared to cut rates well before employment turns down this time, even while inflation is still high. It understands the importance of avoiding a recession and it knows what to do. It has done it before. In 2001 it was worried about a recession and cut rates repeatedly in order to make sure it didn’t happen. The US and much of the rest of the world were not so fortunate. Australia skipped the global turn-of-the-century recession. So are we headed to the other extreme, an uncontrollable boom as the inflation and commodity price figures suggest? The latest news is that that pressure is easing. Only Norway has enjoyed the boom in export prices that Australia has. Over the past four years we have enjoyed a 40 per cent jump in our terms of trade - a measure of the price we receive for exports compared to the price we pay for imports. Our trade balance is set to turn positive for the first time in years. The Budget papers forecast an extra jump in our terms of trade of 20 per cent in this year alone. But just recently commodity export prices have been slipping. The Commonwealth Bank’s measure has slid 11 per cent so far this month. The more-widely quoted Baltic Dry Freight index has fallen 24 per cent in two months. Demand for Australia’s iron ore, coal, gas and so on is easing. Much of the developed word is in something close to a recession. Most of the big nations will struggle to report an economic growth rate too far above 1 per cent this year. Even China’s growth is slowing. The key question for Australia is whether China will continue to shower our mining companies with wealth regardless. China will if it is now growing under its own steam, producing goods for its own Chinese workers as much as it does for export. It won’t if it its growth is still dependent on the United States. The answer will give us a clue as to which country we’re going to be living in in the years ahead – one heading dangerously up or worryingly down. Or perhaps we’ll muddle through the middle. Our Reserve Bank will be doing everything it can to make sure that we do. "In February 1988, Bob Fitton, an officer at the Australian Taxation Office, was photocopying in the Sydney offices of Greenwoods & Freehills when he spied a log book recording the details of faxes sent out by the accountancy firm. The log book was none of his business. It contained information relevant to the firm's entire client base and Fitton was in the offices to conduct audits against a handful of companies. He began leafing through its pages and recognised the dialling codes for tax havens against some client names..."
It seemed like a normal day working in the tax office. Then the phone rang. "Ms Brady, the Commissioner is on the line," said Jan Brady’s secretary. Jan Brady was the Deputy Commissioner of Taxation at the infamous Chatswood branch of the ATO located on Sydney’s north shore. I worked closely with Brady and was in close proximity to her office. Less than one minute later Ms Brady emerged from her office and requested her secretary to get Margaret Oates, Deputy Commissioner Audit and Senior Tax Council Ian Young to come and see her as soon as possible. When Ms Oates arrived the message was simple. "Michael has settled the case," said Ms Brady. "He said he had his reasons." Oates was devastated. After spending three and a half years on the case she burst into tears. Brady placed a consoling arm around her and said, "I understand Margaret, I’m upset too." After many years working in the ATO I had never seen a senior officer cry before and Oates was a pretty tough woman. Later, Ian Young made an appearance. The mild mannered brilliant lawyer who is now a leading Sydney tax barrister looked shattered. He looked like he had just swallowed a bottle full of angry ant pills as he stormed past me. Later that day I ran into one of the auditors involved in the case and I asked him what all the commotion was. "The c-nt from cowards’ castle (meaning Canberra) has settled our case," he said. I know nothing about the Lowy tax case except what I have read about in the papers. But that particular day I will never forget. It was as if the tax office had lost its innocence. The majority of tax officers are hard working professionals who take seriously their job of protecting the revenue. To have someone from Canberra who had nothing to do with the progress of the case suddenly come in over the top and settle the matter has eaten away at tax officers since that eventful day. So much so that it appears officers involved in the case have spoken privately to journalists. The investigation into the Lowys had not been completed. It was premature to settle. 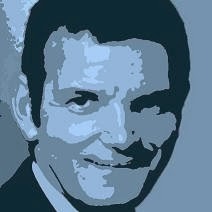 To my knowledge, Michael Carmody settled two cases in his lifetime as Commissioner. The other one was the Robert Gerard matter. Ironically both matters were settled prior to the two gentlemen being appointed to the Reserve Bank Board. Bob Fitton, star of today's Financial Review front story on the Lowy settlement, highlighted the same reservations in his submission to federal parliament’s Public Accounts and Audit Committee. The Committee Chair Sharon Grierson MP said last month there was no compelling evidence to change the ATO’s settlement guidelines. She might regret those words. THE Nine Network has axed two of its high-profile news and current affairs programs, Nightline and Sunday, in dramatic changes to its line-up announced today. In a statement, Nine said today the Sunday program would close on Sunday, August 3, and be replaced by a weekly hour-long news bulletin on Sundays from 8am. Nine's late-night news program, Nightline, will finish tonight. Director of news and current affairs John Westacott said the decision to close Sunday was "difficult but inevitable". "There is no joy or feeling of professional achievement to end programs with such illustrious histories, " he said. "During its 27 years on air Sunday has been at the forefront of ground-breaking and award-winning television: much envied for its journalism bravery and professional diligence." Who did the Howard years help? This is from the latest NATSEM AMP report out today. The incomes of Australians in the highest-income ten per cent of suburbs and towns rocketed up compared to the rest of us. ...meaning that their "after housing-costs" income soared compared to everyone else. Fortune blessed them (and lets face it, they were well-off to start with). Only a year ago Australia’s inflation rate was 2 per cent - at the bottom of the Reserve Bank’s target band. The relentless march of petrol prices, food prices, mortgages and rents has now pushed it up to 4.5 per cent and may push it even higher. Probably not, in the view of the Reserve Bank and its Governor Glenn Stevens. They are focused instead on thier own measures of the so-called underlying inflation rate that either discard or downplay the really big price movements in both directions. Right now those are the increase in fuel prices – up 8.7 per cent in the quarter, and the slide in fruit prices – down 7.4 per cent. ...well above the 0.6 per cent it would like, but importantly down on what it was in the previous quarter. Believe it or not, that means the Bank is pretty pleased with itself right now. Its two interest rate hikes last year and its two this year (plus the extra hikes imposed by the banks) appear to restraining our spending and restraining price pressure. If that continues, inflation should fall back to where the Reserve Bank wants it – not quickly, but eventually. The Reserve Bank isn’t in a hurry. So long as the underlying rate keeps falling, or keeps looking as if it will fall, it would be unfazed if it took until the end of 2010 for the underlying rate of inflation to get back to 0.6 per cent. It won’t be pushing up interest rates in order to hurry it along. Mortgagees, and Kevin Rudd and Wayne Swan can rest easy. The Bank might even be prepared to cut rates if needed without waiting for inflation to finish falling back to within its target band and without waiting for serious evidence that the economy is in trouble. The Reserve Bank looks ahead when it makes its decisions. If it can see that Australia’s economy is about to turn down (as has the ACT’s) or if it can see that unemployment is about to climb, it will cut rates ahead of time. It is tasked with avoiding a recession as well as controlling inflation. It takes both responsibilities seriously. Today's number was 1.5 per cent for the quarter, 4.5 per cent annual - which looks bad. "Strip out housing and financial services and the inflation result improves dramatically – down from 4.5 per cent to 3.3 per cent. And if you go further and take out petrol (another factor outside Reserve Bank influence), all of a sudden the inflation reading doesn’t look so bad after all." Only one other state – Tasmania – reported such a slide. The ACT’s rate fell from 4.6 to 4.4 per cent. 1.2 per cent in the June quarter - a rate bettered only in Hobart. the introduction of the Goods and Services Tax in 2000.
cent jump in the price of alcohol. “alcopops” tax introduced ahead of the May Budget pushed up spirits prices. tax as we said it would,” he said. The Treasurer Wayne Swan said he had inherited inflation at a 16-year high. 18.7 per cent, far more than the national average of 7.4 per cent. The weaker consumer prices reflect a weaker ACT economy. March quarter according to state final demand figures released last month. On an annual basis economic activity in the ACT scarcely grew at all. possibility that inflationary pressures have peaked. Securities chief economist Craig James. two weeks time on Tuesday August 5. Never once on the countless occasions that Australian governments have restricted the sale of tobacco have they felt compelled to compensate the manufacturers for ''significant reductions in their profitability''. Why would they? The cigarette manufacturers knew what was coming (and had decided to invest anyway) and were blessed with rusted-on customers. But there was another more important reason why our governments didn't offer ''compensation'' to the industry they were trying to cripple. To do it would have been to accept that the existing tobacco manufacturers had continuing ''rights'' that the government had to buy out in order to proceed. It would have helped create a precedent that would have undermined the right of Australia's parliaments to act as they saw fit. The Government's independent climate change adviser, Ross Garnaut, saw the danger clearly in his interim report delivered earlier this year. Among the reforms for which he pointed out Australian businesses have not been compensated were the floating of the dollar, the introduction of the goods and services tax and the massive tariff cuts that Garnaut himself oversaw as Bob Hawke's economic adviser in the 1980s. By the same token he pointed out that there had been no tradition of taking away from businesses the extraordinary windfall gains that they had enjoyed as a result of government decisions, including cuts in the company tax rate. In the case of emissions trading, businesses had been ''aware of the risks of carbon pricing for many years''. Many had ''sought to re-engineer their production processes to reduce their reliance on emissions''. He must have been worried that the argument wasn't getting through. In his draft report released just days before last week's Government green paper, he devoted an entire appendix to applying the argument explicitly to coal-fired electricity generators. There was ''no basis'' for the claim that generators had a ''right to emit carbon dioxide and this right is being taken away by a policy change''. As he put it ''governments always retain the absolute right to vary policy and industry is generally cognisant of the risk''. There's no doubt that Australia's coal-fired electricity generators have been cognisant of the risk. They have been lobbying on the basis that their businesses have been at risk since way back before Australia took part in the Kyoto negotiations a decade ago. But last week, despite all they'd done, and despite all that Garnaut had said, they succeeded in convincing the Australian Government that its 2010 emissions trading scheme was unexpected and that they needed compensation. Try submitting that sentence to the laugh test. That is, try to read it out loud without laughing. The truth is that when it finally makes a decision on the type of emissions trading system that Australia will have from 2010, Parliament will have ended, not added to, the uncertainty that has been making Australia's electricity market a risky investment proposition. Does Wong really think that investors will stay away from Australia's electricity market when they know what the rules are? Does she really think they haven't had a fair idea of what was coming for a decade? Apparently she does. Her green paper proposes making cash payments or payments in the form of free pollution permits to all of the coal-fired power stations that were in existence or planned before June 3, 2007. Why that date? Because it was the day on which former Prime Minister John Howard came out in support an emissions trading scheme, the day the idea ''became bipartisan policy in Australia''. The Minister says that Sunday, June 3, 2007, was ''the point beyond which investors could not reasonably argue that they had no knowledge of a potential carbon constraint''. It's actually worse than funny. By giving a gift to a class of firms that neither needs it nor deserves it (quite separate to the grant of free permits to exporting and import-competing carbon-intensive firms such as aluminium producers who will need them), Wong has opened the door to all sorts of special pleading. Woodside Petroleum is just the first cab off the rank. If dirty coal-burning power stations can get compensation, why not cleaner natural gas producers? It's the sort of endless special pleading for access to ever-widening and ever more complex loopholes that killed the goods and services tax the first time the Coalition proposed it. John Hewson was unable to explain why he would be taxing a cold pie but not a hot pie and lost the 1993 election. Australia's existing coal-fired power stations won't need the compensation anyway. They will be able to pass on the extra cost of the emission permits. They will be encouraged to. It is how the scheme is meant to work. Eventually the higher price of power will prod some of us to use less of it, and eventually wind and commercial solar power generators will become competitive against coal because they won't to buy emission permits. But none of that will happen in a hurry. In the short term we will have no choice but to buy our power from the existing coal-fired generators. It is where our power comes from. It is likely that by the time those plants are out of commission they would have been out of commission anyway. The generators will doubtless pocket the gift Wong plans to give them (the NSW Government will be one of the biggest beneficiaries, owning many of the generators) but it won't encourage them to give up lobbying. Why should they when another part of the minister's plan has the parliament resetting the five-yearly carbon-reduction target each year? The tobacco industry would love the opportunity. It shouldn't be given to a dinosaur industry that has served and will continue to serve Australia well and has known for years that its days were numbered. Everything old is new again. On line. "The Budget is passed; and it only remains for those whom it is designed to rob to use every means in their power to resist the gross injustice... and the fraudulent cruelty, that this political juggler is inflicting on the poor." It is a response to the British budget of 1869 from the satirical weekly Tomahawk. Colin Steele of the ANU found it for me on the Nineteenth-Century Serials Edition (ncse), a new free fully-searchable online collection of nineteenth-century periodicals and newspapers, presently in beta. It is even indexed for people, places, institutions, and subjects. Right now I am reading the 1858 English Woman’s Journal. Also in it are the Monthly Repository (1806-1837), the Unitarian Chronicle (1832-1833), Northern Star (1838-1852), Leader (1850-1860) and the Publishers’ Circular (1880-1890). The Green Paper is "a reasonable start"
So says Tim Colebatch in today's Age. "YOU can think of yesterday's green paper as a sandpaper job. Labor had already committed to introduce emissions trading as the best way to reduce our greenhouse gas emissions. Such a plan has sharp edges that stand to hurt voters and business alike. The green paper is about keeping the design while smoothing off the sharp edges." One of the world's five hottest! What's the most dodgy part of the emissions trading green paper? I reckon it's this: A promise of special direct assistance to existing coal-fired power stations on the grounds that it will encourage companies to invest in Australia. The existing generators have already invested. And quite a long time ago. Anyone who built a coal-fired power station recently would have known what was coming. "If the change in regulatory arrangements was unanticipated and implemented without compensation, and investors viewed this as evidence that the Government was likely to change the regulatory regime in future in an unpredictable way, then investors might regard Australia's electricity market as a riskier investment proposition. An increased perception of risk would increase the expected returns required by investors before they would invest, potentially delaying new investments in the generation sector. The extent of this risk is unquantifiable as it is based on the subjective views that investors may have held in the past and the view that they may take of the stability of the new investment environment in electricity." Come to think of it, it these sentences fail to pass Professor Garnaut's "laugh test". Can you read them out loud without laughing? As Garnaut has reminded us, when tariffs were cut Australia didn't compensate existing manufacturers, because it wouldn't cop crappy arguments like this one. This is a handout resulting from lobbying. Nothing more. Much of it will go to the beleaguered NSW government which owns coal-fired generators. It's now called "Australia's Carbon Pollution Reduction Scheme"
And at first glance it looks pretty good. The main thing missing as far as I can see is Garnaut's brilliant multiple-trajectory arrangement for helping get the rest of the world on board and adjusting to the new reality when it does. The related thing that seems to be missing is any ability to strengthen (or weaken) the target in the light of genuinely new information. Even the scheme proposed by the previous prime minister's Emissions Trading Task Force had that. Step 1: Significant emitters of greenhouse gases need to acquire a 'carbon pollution permit' for every tonne of greenhouse gas that they emit. Step 2: The quantity of emissions produced by firms will be monitored and audited. Step 3: At the end of each year, each liable firm would need to surrender a 'carbon pollution permit' for every tonne of emissions that they produced in that year. The number of 'carbon pollution permits' issued by the Government in each year will be limited to the total carbon cap for the Australian economy. Step 4: Firms compete to purchase the number of 'carbon pollution permits' that they require. Firms that value carbon permits most highly will be prepared to pay most for them, either at auction, or on a secondary trading market. For other firms it will be cheaper to reduce emissions than to buy 'permits'. Certain categories of firms might receive some 'permits' for free, as a transitional assistance measure. These firms could use these or sell them. The Government's commitment to reduce emissions by 60 per cent from 2000 levels by 2050 provides a longer term anchor for the emissions trajectory. The Government proposes that scheme caps could be set for five years in advance, or longer in the event that international obligations extend beyond this. Scheme caps would be extended by one year, every year, to maintain a constant five-year cap horizon. The Government proposes that beyond the five-year period of scheme caps it will identify a range within which future scheme caps will be set—a 'gateway'. As the Government extends caps, it must choose figures that lie within the gateway. Gateways are proposed to extend for 10 years beyond the scheme caps, and to be extended by another five years, every five years. In 2008, the Government proposes to announce a methodology for setting scheme caps for the period 2010–11 to 2014–15, consistent with the national emissions trajectory. In early 2010, the Government will announce the finalised scheme caps for the first five years of the scheme (2010–11 to 2014–15) based on the decision rule. The scheme is estimated to place obligations on around 1,000 liable firms, covering the bulk of national emissions. More than 99 per cent of all firms in Australia will not need to be directly involved in the regulation of emissions or be required to purchase permits. The Government does not consider that it is practical at this stage to include agriculture emissions in the trading scheme at commencement. While the Government is disposed to eventually include agriculture, it has decided that the earliest that agriculture should enter the Carbon Pollution Reduction Scheme would be 2015, with a final decision on inclusion or exclusion to be made in 2013. The Government also proposes that there be a cap on the price that businesses would be required to pay for permits from the period 2010–11 to 2014–15. This would act to cap not only the costs of individual firms but also the costs of the scheme overall. The Government intends to set the price cap at a level that is above the estimated market price of permits. The intention is that this cap on compliance costs only be used in exceptional circumstances, but it would exist to counter circumstances that would not be consistent with a measured start to the scheme. The price cap would be reviewed at the first review point for the scheme. The Government will cut fuel taxes on a cent for cent basis to offset the initial price impact on fuel associated with the introduction of the Carbon Pollution Reduction Scheme. The Government will periodically assess the adequacy of this measure for three years and adjust this offset accordingly. At the end of the three year period the Government will review this adjustment mechanism. For heavy vehicle road users, fuel taxes will be cut on a cent-for-cent basis to offset the initial price impact on fuel associated with the impact of the Carbon Pollution Reduction Scheme. The Government will review this measure after one year. Every cent raised for the Australian Government from the Carbon Pollution Reduction Scheme will be used to help Australians – households and business – adjust to the scheme and to invest in clean energy options. Based on currently available information, the Government's preferred position is to allocate up to around 30 per cent of carbon pollution permits to emissions-intensive trade-exposed activities. To ameliorate the risk of adversely affecting the investment environment, the Government proposes to provide a limited amount of direct assistance to existing coal-fired electricity generators. Who's the author of the government's climate change policy? The government's Climate Change "Minister" will outline her decision today. "THE Rudd Government will shield motorists from petrol price rises for at least the first three years of Australia's emissions trading scheme. Defying its expert adviser on climate change, Ross Garnaut, the Government today will announce its intention to include petrol in the emissions trading scheme, but to offset resulting price increases with corresponding cuts in fuel excise. For every cent petrol rises due to emissions trading, a cent will be knocked off excise - for a minimum of three years after the scheme is launched. After that, the policy will be reviewed. The decision to offset petrol price rises mirrors the policy announced by the Coalition last month, and is a response in part to extreme sensitivity in the electorate on rising petrol prices. Neutralising the price effect on petrol runs contrary to the advice of Professor Garnaut, who recommended that petrol be included in the scheme, with compensation directed to low-income earners. Earlier this month, while launching his draft report, he also explicitly advised against using excise reductions to shield motorists. "If you are simultaneously reducing excise then you would send some funny sort of signal because what this is all about is encouraging people to economise on activities that are intensive in emissions," Professor Garnaut said." Penny Wong's speech to the National Press Club will be televised on the ABC from 12.30pm. The Green Paper will be here from 1.00pm. Good coverage here from 1.00pm. Fannie Mae and Freddie Mac - what are they? "Fannie Mae — the Federal National Mortgage Association — was created in the 1930s to facilitate homeownership by buying mortgages from banks, freeing up cash that could be used to make new loans. Fannie and Freddie Mac, which does pretty much the same thing, now finance most of the home loans being made in America. The case against propping up Fannie and Freddie begins with their peculiar status: although they’re private companies with stockholders and profits, they’re “government-sponsored enterprises” established by federal law, which means that they receive special privileges. The most important of these privileges is implicit: it’s the belief of investors that if Fannie and Freddie are threatened with failure, the federal government will come to their rescue. This implicit guarantee means that profits are privatized but losses are socialized. If Fannie and Freddie do well, their stockholders reap the benefits, but if things go badly, Washington picks up the tab. Heads they win, tails we lose. But here’s the thing: Fannie and Freddie had nothing to do with the explosion of high-risk lending a few years ago. Still, isn’t it shocking that taxpayers may end up having to rescue these institutions? Not really. We’re going through a major financial crisis — and such crises almost always end with some kind of taxpayer bailout for the banking system. And let’s be clear: Fannie and Freddie can’t be allowed to fail. With the collapse of subprime lending, they’re now more central than ever to the housing market, and the economy as a whole." All in all, a successful operation. The new mortgage rate scorecard: St George: 9.67%; ANZ and Commonwealth: 9.62%; Westpac and NAB 9.61%. Note that most rates actually charged are discounted by 0.6 percentage points from these "standard" rates - for the moment. Westpac Banking Corporation today announced an increase of 0.14% to its standard variable home lending rates to 9.61% effective Thursday 17 July 2008. “Volatility in global funding markets continues to impact Westpac’s average cost offunds,” Westpac Group Executive, Consumer Financial Services, Peter Clare said. “While passing on some of the additional costs to customers, we are continuing to absorb a significant portion of the additional longer-term funding costs that we have experienced since the market volatility began almost 12 months ago. There's nothing to say that they won't push up rates again. But, the Reserve Bank is not likely to judging from the words of its Board Minutes released today and quoted below the fold. "Members concurred that the evidence becoming available in the latest month had added weight to the view that the current stance of policy, in conjunction with the more general tightening in financial conditions that had occurred since the middle of last year and most recently the additional rise in fuel costs, were working to restrain demand. Consumer spending had slowed significantly and there had been a marked decline in the growth of credit to both households and businesses. Surveys indicated that confidence had fallen further over the past month and asset prices were weakening. In addition, there were some early signs of softening in labour market conditions. The deterioration in conditions in financial markets over the past month had probably tightened financial conditions a little further. On the other hand, members expected that the CPI for the June quarter, which would be released before the next Board meeting, would show another high reading. These high outcomes risked lifting inflationary expectations and/or wage demands. If that occurred, it would make inflation more difficult to reduce over time. Members were also conscious that the rise in the terms of trade that was taking place would add substantially to national income and that this could translate into renewed growth in spending. This meant that there remained considerable uncertainty about the outlook for demand and inflation. On balance, while members remained concerned about the current rate of inflation and the uncertainties about the outlook, the increasing signs that demand was slowing suggested that the existing policy setting was exerting the appropriate degree of restraint. Provided demand continued to evolve as expected, inflation was likely to decline over time. Weighing up the various factors, the Board judged that the current stance of monetary policy remained appropriate and would continue to evaluate prospects for economic activity and inflation in the light of new information. The Board decided to leave the cash rate unchanged at 7.25 per cent." Emissions trading. Time for leadership. "Ultimately, a political party must develop policies it believes are in the best interests of Australia." "The Economist magazine featured a small article this week on the mountain pine beetle and the damage it is causing to Canada’s magnificent Pacific coast forests. The beetle, no bigger than a grain of rice, has managed to destroy an area of lodgepole pine forests the size of England in recent years and is now marching eastward. It’s now eyeing off swaths of jack pines that have no natural resistance to it. The Canadian Forest Service, doing what it can to stop the march of the beetle, argue that climate change is a major reason for the pest’s success. Harsh Canadian winters normally kill the beast, but since the 1980s they just have not been cold enough to do the business. But it seems the beetle’s march across Canada’s boreal forest may be completed before the Federal Opposition works out its position on an emissions trading scheme. Brendan Nelson called a press conference last week to explain the Opposition’s ETS stance. You’d have thought that, having a position, and then articulating it to the genteel and reasonable members of the Canberra press gallery, would be relatively easy. The key problem was Dr Nelson suggesting that the coalition backed an ETS by 2012, only if big polluters such as China and India came on board. “We should not start an emissions trading scheme in Australia until we’re absolutely confident that the rest of the world has a start date for dealing with climate change itself,” he said. In other words, it’s a conditional ETS. That position, however, puts him at loggerheads with the policy that the coalition took to the last election, and at loggerheads with even the position John Howard managed to finally agree upon. Julie Bishop was the first senior Liberal forced to try to explain that what Dr Nelson actually meant was that the Opposition backed a 2012 start-up for an ETS, condition-free. But then the party’s defence spokesman Nick Minchin backed the leader, saying Australia should not “push the button” on its ETS if China, India and the US have not given an indication on what they will do. That forced climate change spokesman Greg Hunt to take issue with that position. And then Dr Nelson piped back up, saying Australia should not be moving without “firm commitments from the rest of the world in terms of what they are going to do”. Malcolm Turnbull, who remember was the environment minister in the Howard government, tried to argue that the Opposition’s policy was clear. But he also added what amounted to be an admission that while Ms Bishop and Mr Hunt knew what they were talking about, the leader might not. The Opposition leadership, at best, is appearing hugely confused about an issue that is shaping as the most important economic change to face Australia. At worst, it looks like a group of climate change denialists who want to put their head in the sand and hope it all goes away. In Japan, Kevin Rudd got a special invite to talk with the G8 about issues such as climate change, oil prices and the global food crisis. So you’ve been left with the picture of Kevin Rudd mixing it with those nations which will be key to any global solution to greenhouse gases, and Dr Nelson tying himself in linguistic knots over this party’s position on an event that might be four years hence. The fact crowds of people have been turning out to listen to Professor Ross Garnaut talk about his draft paper on the ETS should be taken as a warning inside Opposition tactics central that the Liberals risk losing all relevance on this debate. On Wednesday Climate Change Minister Penny Wong will release the Government’s green paper on the ETS. It will run through a huge variety of options that will ultimately feed into a white paper and final position. As The West Australian revealed this past week, one of the key elements will be how the scheme interacts with the tax system. Depending on how the scheme is structured and defined, the States could gain a huge windfall in GST revenue. While that might be great for the bottom line of Alan Carpenter and Eric Ripper, that windfall would come in the guise of a large increase in taxation on the economy which would be coming to terms with the price changes flowing through it due to the ETS. It’s not clear whether Canberra is prepared to hand over so much more cash to the States and Territories while at the same time compensating households and businesses for the financial shocks caused by finally putting a price on greenhouse gas emissions. The problem is that the GST issue might of itself require extra compensation to households and businesses on top of what they will need to get to cope with the impact of the ETS. But the coalition is too busy to focus on these type of issues because it’s worried about who might or might not be prepared to cut greenhouse emissions in 2012. It’s also cut off a policy option by its position on petrol in an ETS. Ultimately, a political party must develop policies it believes are in the best interests of Australia. The Opposition, by getting into a debate over what other countries might or might not do about greenhouse gases, is drifting away from that cornerstone of politics and policy. At this rate, Brendan Nelson risks becoming another lodgepole pine facing an avalanche of mountain pine beetles." Chè is my nephew, the really talented member of our family. He is 15, and writes classical music as well as popular songs. He has his own YouTube channel, entitled Chemiecta. "It's about how growing up will leave me deprived of all the attention I have grown so accustomed to. Now that I am actually in year nine, and my voice is breaking, and everyone thinks the year eights are so much cuter than me, this song holds special significance to me." Brilliant (if his less-talented uncle says so himself). For some us work’s a ball. We gossip, we socialize, we treat our colleagues as if they’re our second family. But at times we feel guilty. We wonder whether we are actually getting enough done. Our employers probably wonder too. They would doubtless like to wire us up to machines that tell then who we have been talking to and for how long and then dock our wages accordingly. Alex Pentland from the Media Laboratory at the Massachusetts Institute of Technology has been trying them out. He says they “extract speech features in real time to capture nonlinguistic social signals such as interest and excitement, the amount of influence each person has on another in a social interaction, and unconscious back-and-forth interjections, while ignoring the words themselves in order to assuage privacy concerns”. Amazingly he and his team at the MIT have found entire workplaces happy to subject themselves to the machines for weeks at a time in order to allow him to examine what real people do when they are put together in a workplace for hours each day. He has discovered that it is quite different to what they do with email. The people who emailed a lot were not those who talked a lot. And guess what? Big emailers are unproductive. The team wired up groups workers at an IT company and discovered that some talked an awful lot, especially to colleagues who weren’t relevant to the task at hand. In one group the worker that chatted the most was 60 per cent more productive than the worker who chatted the least. But a lot depended on when the talking took place. Chatting between tasks boosted productivity. Chatting in the middle of tasks harmed it. The findings don’t automatically mean that you should talk more at work. The researchers weren’t able to test for causality. It might be that the productive workers just happen to be those who talk rather than that talking creating productivity. But it probably does mean that even if you spend an absurd amount of time socializing and enjoying the company of your colleagues, you shouldn’t feel guilty. So long as you’re getting things done. Wu, Lynn, Waber, Benjamin N., Aral, Sinan, Brynjolfsson, Erik and Pentland, Alex, "Mining Face-to-Face Interaction Networks using Sociometric Badges: Predicting Productivity in an IT Configuration Task" (May 7, 2008). The man who spearheaded the government’s push for a FuelWatch scheme in the face of opposition from the Coalition and the oil companies has been reappointed Chairman of the Australian Competition and Consumer Commission. But Graham Samuel, a former investment banker and Liberal Party office holder will serve in the position under Labor for only three years instead of the usual five. He told the Canberra Times that the decision was his. In three years time he will be 65 and would like to be able to move into another role in public service, in corporate life or in the not-for profit sector. “Most of those roles expect people at 65 to be able to devote at least five years to job. If you go at 67 or 68 you’ve only got two years in it, and it’s just too late,” he said last night. Mr Samuel will be joined as Deputy Chair by Peter Kell, the current head of the consumer organisation Choice and a former head of Consumer Protection at the Australian Securities and Investments Commission. Peter Kell has been appointed for five years. ...particularly over the past three or three or four months, when it wasn’t clear whether I would get reappointed, but as it turned out the Australian government didn’t agree with them”. The government has also appointed a second Deputy Chair, Michael Schaper, a former ACT Small Business Commissioner who will have special responsibility for assisting small businesses in their relationships with big business, - a promise made by Labor during the election campaign. The current Deputy Commissioner Louise Sylvan will be appointed to the Productivity Commission in order to broaden its expertise in consumer protection and social issues. Graham Samuel next challenge will be to present the government with the report of his six-month investigation into grocery prices. “I’ll be going through the drafts of the chapters this weekend,” he said. The report is due in a fortnight. In the meantime the Melbourne-based ACCC Chairman has a recommendation for ACT shoppers. When he stays overnight in his flat in Barton mid-week he buys small $4.95 cans of caviar from a local supermarket and eats them with toast and avocado. “They’re good value, with sardines and scrambled eggs as well,” he said. “I enjoy staying the ACT mid-week”. "The Commonwealth Bank today announced that as a result of the continued increasing cost of funds that it is experiencing that it was increasing its variable home loan interest rates by 0.14% pa. This means that the Bank’s standard variable rate home loan will increase from 9.44% pa to 9.58% pa..."
Right now the ANZ and Westpac are charging 9.47%, the NAB is charging 9.46, and St George boosted its rate 20 points to 9.67% last week. The banks are widening their margins while they can in case the next move in interest rates is down. UPDATE: Late Friday the ANZ Bank has followed the Commonwealth, up to 9.62%. finance data just seems to be collapsing." "This is a bizarre way to put some assets on your books." Has our jobs market peaked? Australia’s jobs market is on the edge of turning down after nearly two years of continuous growth. Labour force figures released yesterday show that employment in the ACT, NSW and Tasmania has already turned down and the national rate of job creation has collapsed. Until March this year jobs were begin created Australia-wide at the rate of 17,000 per month. Since April that rate has fallen to 800 per month. The ACT has lost an average of 1,000 jobs in each month. Lehman Brothers economist Stephen Roberts said the jobs market was on the edge of deteriorating and that an apparent upturn in June was “mostly statistical noise”. The seasonally adjusted figures showed that 29,800 jobs were created in June after 25,600 jobs were lost in May. The unemployment rate was little-changed at 4.2 per cent. The Treasurer Wayne Swan said that “given the global credit crunch and given the global oil shock the figures are very welcome indeed”. “The economy has been slowing. So given that, these are very encouraging figures. I for one am optimistic about the future of the Australian economy,” the Treasurer said. Opposition employment spokesman Julie Bishop described the jobs market as “steady” but said that she was worried about the year ahead. Westpac’s Anthony Thompson said looking through the monthly volatility jobs growth was continuing to slow. market in more than 30 years. He expected the unemployment rate to climb gradually to 4.5 or 4.7 per cent by the end of the year. The ACT’s unemployment rate remains the lowest in the country at 2.3 per cent. Every other state or territory has an unemployment rate above 3 per cent, and NSW, Victoria and South Australia have rates above 4 per cent. Only 4,507 ACT residents were unemployed in June. 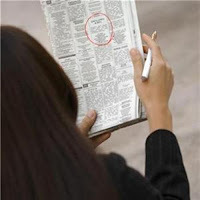 In May the Bureau of Statistics reported that 5,600 ACT jobs were vacant. In s preliminary assessment of the Australian economy released yesterday the International Monetary Fund said it “shared the authorities view that economic activity is beginning to slow”. However it said in its view the balance of risks was “tilted toward the upside”. Much higher commodity prices, big immigration flows, and increased infrastructure spending should provide a boost to economic activity. The Fund described Australia’s outlook as “more uncertain than usual”. It said it was essential for the Reserve Bank to “maintain a tight policy stance until it is clear that inflation will abate”. This year’s IMF preliminary assessment of the Australian economy is the first to be publicly released. The Treasurer Wayne Swan said he had authorised its release in accordance with Australia’s support for enhanced transparency of the IMF process. The assessment represents the initial thoughts of Fund officials after visiting Australia to speak to the Commonwealth Treasury, the Reserve Bank and private sector organisations. The Fund’s final report will be released later in the year. A leading economist has warned that Australia runs the risk “talking itself into recession” as new data confirms that home buying is plummeting and consumer confidence is diving to recession levels. The latest Westpac Melbourne Institute measure of consumer sentiment released yesterday shows that confidence slid to a 16-year low in July, with the index diving below 80 points for the first time since the wake of the early 1990’s recession. An index number below 100 indicates that pessimists outnumber optimists. Disturbingly, only 35 per cent of the consumers surveyed agreed with the proposition that “now was a good time to buy a major household item”. Almost half – 47 per cent – agreed that now was a bad time to make a major household purchase. In the four months to May the number of new home loans slumped 25 per cent – the biggest slide in the three decades since records have been kept. Canberra home borrowings began sliding earlier and are down 30 per cent in the last year. In May 2007 a total of 1,046 new loans were issued to buy houses. In May this year there were just 727. The chief economist at CommSec Craig James said homebuyers were “effectively on strike” until they are convinced that mortgage rates would not rise again. The decision by the St George Bank to independently lift its standard variable mortgage rate from 9.65 per cent to 9.67 per cent on Monday would not have helped. “It raises an interesting point about where all our extra people are choosing to live,” Mr James said. Westpac’s Chief Economist Bill Evans said that consumer confidence had plunged to its lowest point since January 1992 “when consumers were still recovering from the brutal recession of 1990-1991”. “The most probable explanation is petrol and oil prices,” he said. CommSec’s Craig James said the link between petrol prices and consumer confidence was “unmistakeable”. Share market wealthy had slid 9 per cent in the last month and looked set to slide further. “The share market has continued to slide, petrol is near record highs, rents are soaring and there is no interest rate relief in sight,” Mr James said. “The Reserve Bank would be best advised to give consumers some breathing space and hold off on rate hikes for a few months,” he said. Employment figures due out today will be watched for further signs of a downturn. All three measures of job advertisements are down and the Department of Employment’s leading indicator of employment index has fallen for the sixth consecutive month. In May the number of Australians in jobs fell for the first time in 19 months. "The water must come from Tasmania"
On one hand Australia's economy is..